You guys know me by now. I share most of my adventures with the public either here or via social media. I have made myself a deliberate advocate of traveling for travel’s sake and spending time outdoors to connect with nature. As with a lot of people these days I tend to get caught up in recording my excursions, sometimes to the detriment of the trip itself. I’ve found that often the act of stopping to take a quick snapshot to share on social media really disrupts the moment, it imposes on the natural flow of the experience, pulls you out of it and makes you a spectator instead of a participant. With my focus on photography I am especially guilty of this and some experiences are diminished because of it. There is something to be said for simply letting an experience happen, enjoy it, immerse yourself in it. This would be the lost art of Being in the Moment. I recently took a day trip that was such a rich experience, for me, that I didn’t want to interrupt it. I only took three pictures in 6 hours of riding and they were all at natural stopping points, natural lulls in the experience where the action didn’t become an imposition. My mind and body were immersed in the experience and it was a wonderful feeling. Last weekend I had been planning on a multi-day trip but things didn’t come together and I settled for a Saturday morning ride to explore on the motorcycle. I woke up early before the valley started warming up with the morning sun, packed my camera equipment, loaded the bike and hit the road toward Payson and cooler temps. With a shiny new copy of the Arizona Backcountry Discovery Route (AZBDR) map in hand I figured I’d first check out Fossil Springs Road outside Strawberry, then see if I could find myself on some section of the AZBDR to see what it was like. After finding Fossil Springs Road closed (apparently it’s been closed for a long time due to road conditions) I turned up 87 cruising past Clint’s Well and joined the AZBDR on FSR 95 near Blue Ridge Reservoir. But not before a little detour. That was my first, and last, glimpse of Blue Ridge Reservoir until last weekend. I have been riding without the use of a GPS or my phone maps. It’s helps me to get better about remembering my routes and it’s also led to some cool accidental discoveries. I took the wrong road off of 87 looking for 95. I saw a sign that read “Blue Ridge Reservoir Access” and mistakenly took that for my turnoff. I kinda knew I had taken the wrong road. Even as I cruised along on the smooth, redish dirt road I knew it was wrong but went anyway just to see what I could see. The road I did turn on, FSR 751, turned out to be a very nice dirt access road to an unexpected boat ramp at the northern end of Blue Ridge Reservoir. I found myself stopped above a large parking lot busy with kayaks and canoes fanning out in all directions from the narrow boat ramp at the water’s edge. I continued past the ramp and through the parking lot to a continuation of the road on the other side. This section was now more technical single-lane width, rutted and rock strewn that hugged along the edge of the wooded cliffs plunging into the reservoir. The road leads to the dam, but is gated and closed to public access, so I went back the way I came having enjoyed the detour immensely. The reservoir looks very different now, from the north end, 20 years later. Back on pavement and a short cruise further up 87 put me at the road I was looking for. 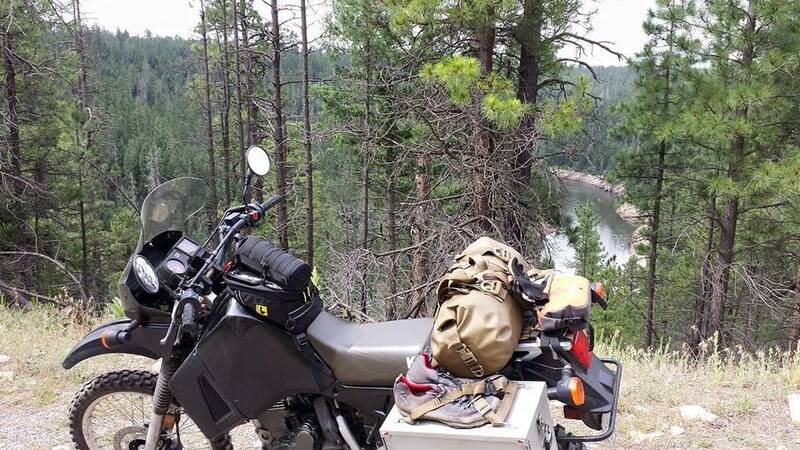 After double checking the map to make sure I was on 95 I soon found myself kicking up dust and zooming along on the KLR through the forest completely alone. I could feel the grin on my face getting wider with every turn in the road. The scenery is spectacular through this area, something that would normally have me stopping every few minutes to haul out the gear and grab some pictures. But I just couldn’t do it. I didn’t want to stop moving, to break from the road, it felt like I would be interrupting something important. There are a few quick views of Clear Creek as the road descends to the narrow bridge which crosses at the confluence of two deep canyons. I considered stopping at the creek, it is absolutely gorgeous at the bottom, but there were a few small groups of people fishing there and I chose to move on. Climbing out of the canyon, 95 cuts deep into the forest and, again, my bike and I crunched over the loose gravel road taking opportunity to open up in the few straightaways. The forest closed in a little more along this section, the roads appeared more well traveled and it was here that I finally shared the road with someone, for a short time. I quickly out-paced the SUV on the tight corners and rutted out road. Those roads are perfect for a motorcycle like the KLR. The AZBDR route continues from 95 east on Rim Road 300 to eventually catch up with HWY 260 that runs between Payson and Heber. 300 sees a lot more weekend traffic as the main access road for all camp and recreational sites above the rim, but it still isn’t a busy road and is dirt almost all the way back to 260. It’s called the “Rim Road” because it literally follows the edge of the Mogollon Rim offering spectacular views of it’s rugged cliffs and the verdant valley below. I came around one corner on 300, well before really seeing any other vehicles, and spooked a small group of some of the biggest, healthiest Javalina I’ve ever seen in Arizona. I tapped at the brakes as they bounded out of the wash and across the road to disappear into the thick forest. Riding on the motorcycle certainly reduces the opportunities to sneak up on wildlife, so the javalina encounter was an unexpected treat. The weather was coming in on me and I knew I had a race on my hands if I expected to make it home before a monsoon caught me on the road. I stopped at the visitors center where 300 meets 260 for a breather and to stretch my legs. I needed to clear the euphoric clouds from my head before getting into traffic. I had originally wanted to document my first foray into part of the AZBDR with some great photos to share the experience. But I realized that some experiences are better, richer, when they are savored and consumed selfishly, gluttonously alone. It might sound stupid to some, but this ride was mine and I feel good about allowing myself to be in the moment and enjoy it. For a few blurry, sun-soaked hours I was completely free. If this was any indicator of what the rest of the AZBDR looks like, I’m in…hook, line and sinker. I’ll be back for sure. Next time maybe I’ll actually pull out the camera so you guys can see what it was like. Or, better yet, come with me and see for yourself!